Next February, Yamaha adds a third YZF-R1 to its sport motorcycle line-up with the more affordable ’S’ variation. Not all sportbike riders need a 164-horsepower street-legal racebike. 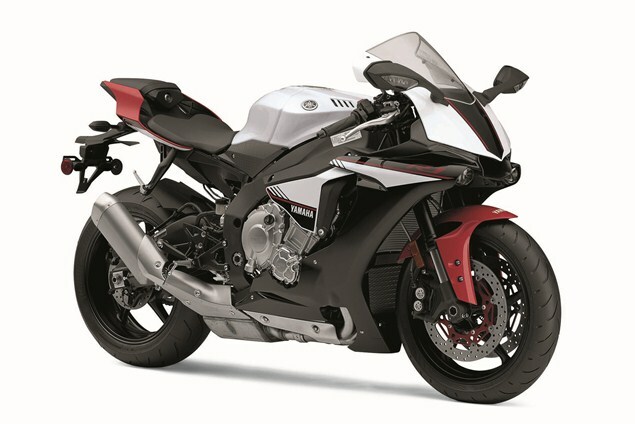 That’s what Yamaha is betting on with the release of its street-oriented 2016 Yamaha YZF-R1S ($14,990). Based off the Tuning Fork brand’s Superbike Smackdown X Shootout-winning YZF-R1 the ’S’ boasts a $1500 price break compared to the standard R1. The ’S’ is powered by Yamaha’s one-of-a-kind crossplane crank-equipped 999cc Inline Four, giving it a hybrid feel and powerband between a sport V-Twin, and a Japanese, and now, German-made four-cylinder. Engine hardware changes are minor and limited to steel connecting rods (instead of titanium) and different valve spring material. The engine covers, oil pan, and five-spoke wheels are all fabricated from aluminum instead of cast magnesium. Lastly the engine cover bolts have been updated from aluminum to stainless-steel as has the exhaust head pipes. The ECU was also refreshed giving it a slightly lower redline and top-end power output. Besides different wheels, and a switch to lower-spec but more durable Battlax S20 tires by Bridgestone, the chassis is unchanged. Also unchanged is the programming of Yamaha’s class-leading electronics suite which includes adjustable traction, power slide, wheelie, and launch control. Always-on ABS and linked braking is also standard. The R1S is expected to arrive at U.S. dealerships this February. Rake: 24.0 deg. Trail: 4.0 in.